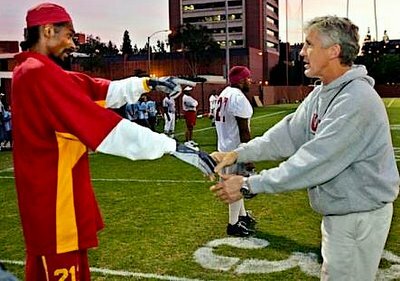 USC games at the Coliseum are known for the collection of hanger-ons that populate the Trojan sideline. Even the Lakers' Luke Walton, who attended Pac-10 rival Arizona, was caught sneaking into the action this year. Bowl championship officials have taken note of the abuses. The Rose Bowl, acting on a directive from BCS administrators (it also applies to the other three BCS bowl games), will allow only five "wild-card" passes to be given out, but only to former players. This means Snoop Dogg (pictured with Trojan coach Pete Carroll), Dr. Dre, Alyssa Milano and Nick Lachey won't be on the sideline. Texas won't have its support group of Lance Armstrong, Roger Clemens, Chris Mihm and Matthew McConaughey. We guess they will have to fight and claw to get a ticket and then sit with the true fans, or what they might refer to as commoners.